Please refer to our stock # JK05 when inquiring. Jonathan Kis-Lev, In the Distance – Composition Views Safed, 2008, Oil on canvas, 35.5” x 29.6". Kis-Lev was born in 1985 to Russian Jewish immigrant parents and spent his childhood years in a small village on the outskirts of Jerusalem. As a young boy Kis-Lev began private lessons in watercolors and oils tutored by a Russian painter. As a teenager, Kis-Lev continued his art studies at Thelma Yellin High School of the Arts. At the age of sixteen, Kis-Lev was granted a full scholarship to study visual arts at Pearson College of the Pacific in British Columbia, Canada. Upon completing his studies at Pearson College, Kis-Lev returned to Israel to join the Israel Defense Force. While still in the army Kis-Lev held his first exhibition in the Tel Aviv Trade Tower where the exhibition attracted attention in the art arena, and hosted amongst others the Mayor of Tel Aviv, Ron Huldai. 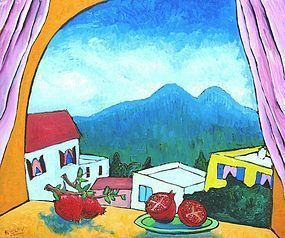 Following the exhibition's success Kis-Lev started to show his artworks in galleries in Tel Aviv, Safed and Jerusalem. Today he is represented by Griffin Gallery Ancient Art in Boca Raton, FL. Kis-lev is one of Israel’s most prominent peace activists winning recognition from President Shimon Peres through Peres’ Young Leaders Forum. Receive Kis-lev’s recent book FREE with every purchase, My Quest for Peace: One Israeli’s Journey from Hatred to Peacemaking.